It is Independence Day and we are celebrating my brother-in-law’s milestone birthday in Boston. Due to a possible hurricane emergency situation, the fireworks had been re-scheduled for July 3rd so we ended up in Boston’s North End on the 4th of July. After a festive Italian dinner, my niece and nephew convinced me to walk over to their favorite Italian pastry shop to pick up a few cannolis for a late night birthday treat. Mike’s Pastry was filled not only with scrumptious desserts and wall to wall people, but just about every inch of the walls and ceilings were adorned with faux tin tiny tulips #148 ceiling tiles or one very similar. 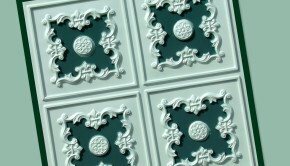 Yes, I know for sure they were faux tin tiles because I actually touched them but there is no way the average person could tell they are made from PVC rather than tin just by looking. Annie and Aaron were amazed at my wealth of ceiling tile knowledge. I explained that faux tin tiles come in 24″ x 24″ square sheets that you can cut with a regular scissors. Installation is as simple as gluing them to the ceiling and or walls. 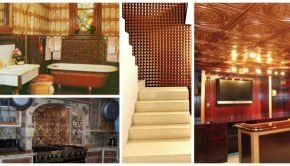 (Be sure to check out the featured faux tin tile glue up installation video!) And because they are faux tin, they are easily washed with soap and water and actually help absorb sound both of which are very important in a busy restaurant setting. i also explained that although Mike’s Pastry stuck with the classic tin look, these tiles can painted to match your decor in any color you choose. If you are a purist, however, this same style is also available from Milan over at Decorative Ceiling Tiles in an Aluminum Ceiling Tile #1204, and the new Shanko aluminum tile #209. Oh and FYI, the cannoli were delicious and it turns out Mike’s Pastry now has an online store so even if you cannot make it out to Boston you can have them delivered directly to your front door! 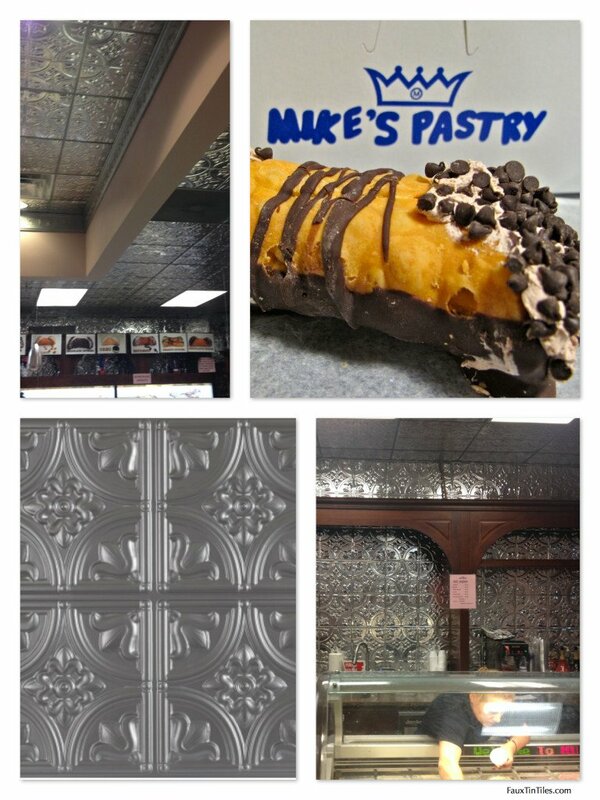 Summary: The decorative faux tin tile ceilings & walls at Mike's Pastry in Boston's North End make this renowned bakery's decor as distinctive as its pastries!